On the maiden voyage of this column, I wanted to write about the fun of gardening. However, I’ve had a spring full of helping others take care of their pests. Nothing is wrong with wanting to protect your prized ornamental plants or edible crops. Yet pesticides are not always the answer and used only as a last resort. I opened the bag and on the top of a sorry mess of damaged leaves perched a ladybug larvae. “What is that, and how can I kill it?” he asked. Judging from the damage on the leaves, I suspected aphids, yet couldn’t find any of the culprits. If you don’t know what a ladybug larvae looks like, you would want to blame them for the damage. They look ferocious, with black bodies and bright orange racing stripes down their sides. With a fierce appetite for plant-sucking insects, they’re an aphid’s worst nightmare. “But what can I spray on my tree?” The man insisted on the most potent pesticide for his tree, purchased it, and left. When he went home and sprayed his trees, he most likely killed all the beneficial insects working for him. Judging by the leaf damage sampling the man brought to me, the tree before spraying, most likely had an army of beneficial insects – green lacewing, soldier beetles, and ladybugs – waging war on the cause of the damage. Killing beneficial insects sets up a vicious cycle of problems. The best approach to handling complications in your garden is with Integrated Pest Management (IPM). 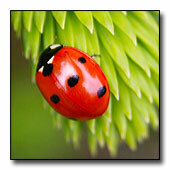 IPM uses a series of evaluations: prevention, monitoring and identifying pests, control, and action or inaction. Prevention means selecting pest-resistant varieties, rotation of crops, and barriers such as row covers that keep the pests away from them. Monitoring and identify pests means you behave like a scout in your garden. You catch a problem early, identify it, and learn everything you can about how to keep it in check. Control is about beginning with the least risky methods, and not automatically reaching for the napalm-effect of a nonspecific pesticide. Once you identify the pest, what’s next? Find out everything you can about your enemy. Sometimes a pest moves in, does it’s damage, and by the time you see the aftermath, it’s gone. No action is necessary. 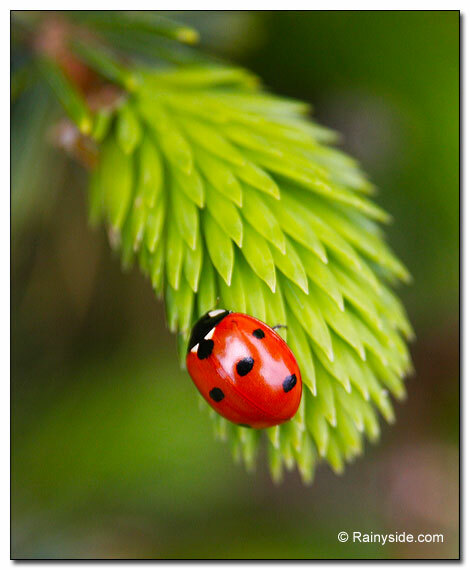 Once you have a good balance of beneficial insects working for you, you may never have a huge outbreak of aphids again. In the spring, minor outbreaks on rosebuds, or leafy new growth will happen. The least toxic method is rinsing the aphids off, or pulling them off with your hand. The next step would be to use an insecticidal soap. A pesticide is not necessary for aphid control. Tent caterpillar controls for minor outbreaks means picking them off by hand and dropping them into a pail of sudsy water. Identify and remove egg masses that wrap around the stems of trees before they hatch out in spring. During a large outbreak (a natural cycle that occurs in nature) you may need to spray a Bt (Bacillus thuringiensis) product on only the plants they are eating. Bt is a bacterium that targets only caterpillars of moths and butterflies and must be eaten by them for the stomach poison to work. Knowing this you need only spray the foliage of plants the caterpillars are feeding on. Once ingested the Bt acts like a stomach poison and the caterpillars stop defoliating your plants and die soon after. If you see a white dot on the forehead of the caterpillars, leave it alone. The white dot is a parasitic wasp egg that hatches and literally eats the caterpillar alive. Gruesome, and effective, next year’s control is also stopping this year’s menace from chewing your prized plants. For safe and effective gardening, be sure you read the labels of any product you are using, including organic solutions. Article originally written for the Kitsap Weekly.